There was once a troubadour named John Darnielle. As a child, he found his heroes in the ring of professional wrestling. There, fearless warriors played their part in a system of justice as black and white as the screens of the televisions upon which they appeared. Years later, that childhood fire of passion still burned bright within the grown man. So Darnielle shed his wolf’s clothing to reveal the caprine skin underneath, postponing his prose to return to the land of the lyric. Along with fellow Mountain Goats Peter Hughes and Jon Wurster, he gives tender and impassioned voice to those Herculean men whose majesty would otherwise go unsung. There is a man who was destined to find fame in the ring, as his father had before him, and his son would do after him. ‘Chavo Guerrero’, born in the tumbleweeds of border town El Paso, would become the “defender of the downtrodden / king of the hill”. There is a man who, long ago, in the midst of a “steel cage free-for-all”, responds to the call for help of his opponent. As the man recalls this still-remembered moment in a croon to his one-time opponent, we can hear a love that is nothing less than the love of one brother for another. There is a man who is more werewolf than man. With the blood of those he vanquished still pooling in the ring (and an aggressive flamenco strumming in our ears), we hear him reject the timid suggestion to restrain himself: “Bring your heroes to the wolf den / Watch them all get crushed”. There is a man who works days and nights in the wrecking yard, and whose couch is always available for the friend passing though – Manuel Ramos is his name. As the years pass, he loses a toe, loses a kidney, and finally loses his sight. But never does his spirit diminish, as he recalls his past glory: the wrestler with bullwhip in hand, ‘Bull Ramos’ his name. In Beat the Champ you will find these and other stories – ballads of glory and woe, of bravery and terror. Of carnage, yes, but also of love. You will marvel at supermen and commiserate with the everyman, realising that sometimes these men are one and the same. 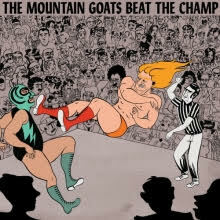 This entry was posted in Arts, Music and tagged Album, Beat The Champ, john darnielle, Jon Wurster, lip, lipmag, music, Peter Hughes, Review, the mountain goats, wrestling. Bookmark the permalink.